Heneghan Peng Architects just scooped first place in an international competition for Moscow's new National Center for Contemporary Arts (NCCA). 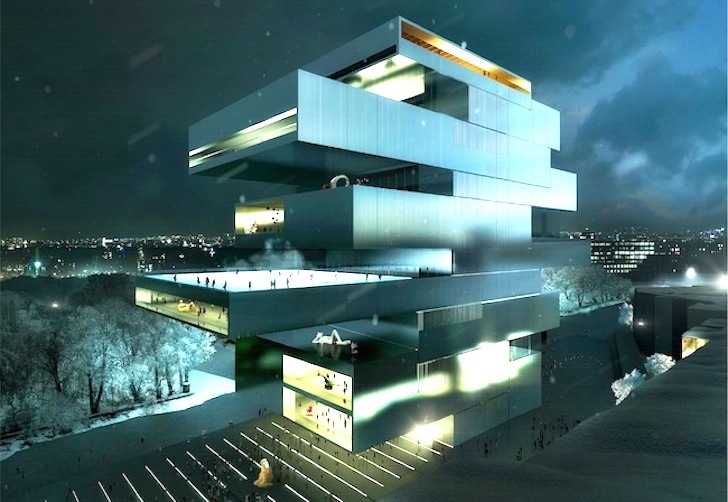 Located at the Khodynskoe Pole, this stacked and cantilevered museum will become Russia’s "national bank of knowledge on contemporary art." Heneghan Peng Architects stacked and staggered multiple museum galleries to create a vertical focal point on the surrounding flat and naturalistic landscape. In homage to the site’s history as an airfield, the Irish architecture firm designed broad boulevards reminiscent of aircraft runways to direct visitors to the NCAA entrance. Within the museum, escalators cut through layers of exposed staff and administrative offices to reach the various galleries. To accommodate a diversity of art installations and programs, exhibition spaces were designed with flexibility in mind. Envisioned as the main national hub for contemporary Russian art, the NCAA will also connect with similar centers around the world to promote the Russian arts on a global scale. The new modern museum will feature a rotating permanent collection and interdisciplinary projects, as well as educational facilities such as a research center with instructive programs. In addition, the new museum will include retail space, a cafe, and a children’s activity center. The new NCCA will also serve as a catalyst of economic development for Khodynskoe Pole. The museum is expected to accommodate 500,000 visitors annually.
. In homage to the site's history as an airfield, the Irish architecture firm designed broad boulevards reminiscent of aircraft runways to direct visitors to the NCAA entrance. Heneghan Peng Architects stacked and staggered multiple museum galleries to create a vertical focal point on the surrounding flat and naturalistic landscape. Within the museum, escalators cut through layers of exposed staff and administrative offices to reach the various galleries. To accommodate a diversity of art installations and programs, exhibition spaces were designed with flexibility in mind. 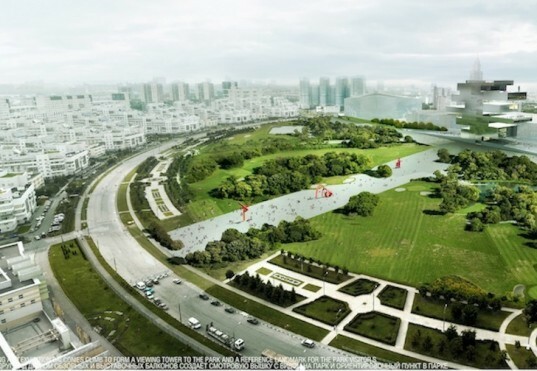 The new modern museum will feature a rotating permanent collection and interdisciplinary projects, as well as educational facilities such as a research center with instructive programs. The new NCCA will also serve as a catalyst of economic development for Khodynskoe Pole.